Abū Manṣūr al-Māturīdī who lived about a century after Abū Ḥanifa, and Abū Musa al-‘Ash‘arī who adopted Sunnite creedal principles in the last third of his life also employed a similar method. The Sunnite Theological School that has been developed around these scholars and their disciples has managed to gather more than ninety percent of the Muslim world. Even though the idea that the Sunnite Theological School was founded by al-‘Ash‘arī has gained wide currency, examining the works that have come to us from the earliest period of Islamic theology show us that it was Abū Manṣūr al-Māturīdī who carried out that task. 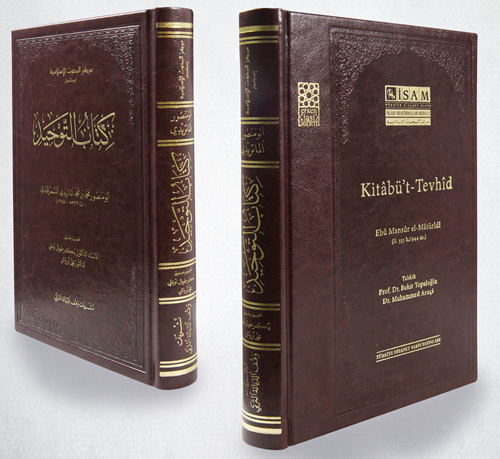 It is an undeniable fact that al-Māturīdī’s Kitāb al-Tawhīd has been the source of the books penned after it in terms of methodology, contents and ways of inference. İstanbul: İSAM Publications, 2017*, 42+582 pgs. * This edition was published in the framework of the Early Classical Period Project.